A new baby has come to shake things up! Make their first sensory experiences include the joyful noise of this cute little zoo rattle in the shape of a classic childhood snack. 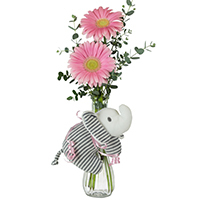 Keepsake toy tied to a small budvase arrangement with two pink gerbera daisies accented with eucalyptus. Gray and white striped plush animal rattle with embroidered eyes for safety comes assorted: either an elephant (shown) or a giraffe. 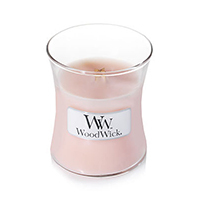 It is tied to the vase with a coordinating pink ribbon, traditional for a girl. Your celebration arrangement is handmade by a skilled designer; contents, dimensions and container may vary.